With the growing popularity in social media it has now became normal for many online business owners to brand their business with social networking sites. Here are a few tips to show you how to brand your business in social media sites. Firstly you need to remember that you are a person before a business, people want to see that you are real and not an entity which they can not speak with or really interact with in any way. Before we continue what we need to make very clear is that you have to listen to your customers, it really does not matter which social media site you are using Facebook, Twitter, Google Plus you have to listen to the wants and needs of your potential customers. It is not enough to just create these social media accounts and then feed them with automated content never to return. Over time your potential customers will realize that this is all you are doing and will leave. When I say leave, I mean not just your social circle but anything related to you. What you have just done to that potential customer by using automated content is alienate them and in their eyes you are no longer trustworthy. Lets say you are trying to build a brand around a online or offline promotion you are running, for this I will use MakeItYourRing Diamond Engagement Rings. This keyword is going to be associated with a diamond jewelry promotion in 2012 so we need to start branding this across the internet now. In actual fact we started sending this promotion out into the social networks at the beginning of October 2011 as we also know that it takes time to get the results and the followers we need when branding anything online. When using social media to advertise or brand your online business you need to take every single opportunity to get your message out there. You need to be networking with others in the social media circles and even writing content to circulate your brand across the internet. There is more and more weight being placed on these social media sites today especially now that Google Plus has now been released. You need to be aware of what is and is not working with social media and always be on the look out for better and more effective options. 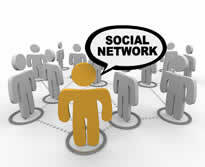 If one social network is not giving you the desired results then move on and find another. An additional strategy is to also be guest posting on other blogs and related websites across the internet and also adding those sites into your social networking efforts. This has two powerful effects, firstly getting more relevant one way back-links to your site and also showing those in your social circles that you are a true authority in your niche. Never ever big note yourself, make sure you are modest about your achievements, people don’t like show offs, by being modest about your achievements it will help your potential customers relate to you much better and they will feel more inclined to comment and interact with you in your social media circles. If you are in a very competitive market place online social media marketing can be one of the most effective tools you can use to stay ahead of your competition. This is a guest post from Ron Cripps who has been online for more than nine years full time. Starting his own online business selling e-books. Then over time realizing the power of affiliate marketing and the potential of generating massive amounts of income online through promoting products and services with social media.